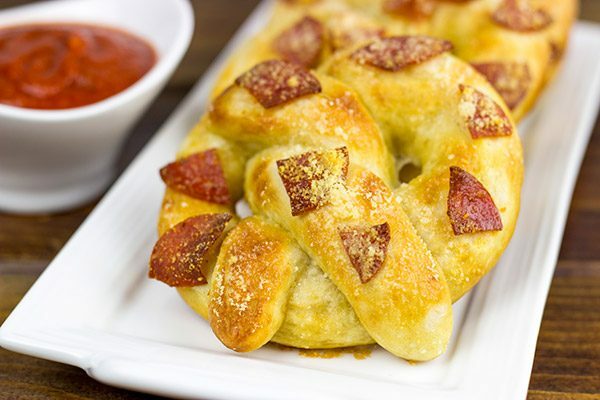 Soft, chewy homemade pretzels topped with tasty pepperoni…these Pepperoni Soft Pretzels make for an excellent appetizer while watching the big game! I’m a sucker for advertising. I see a commercial with a mouthwatering stack of pancakes, and I turn to Laura and tell her we should go out for pancakes. That scenario has definitely played out in our house. Many times. Of course, Laura usually just reminds me that we can make tasty pancakes at home. And then I have to admit that she’s right. That, and taking Robbie out to a restaurant at this age is not my idea of fun. Speaking of being a sucker for advertising, let’s talk pretzel shops. You know the kind they have in malls. Well, they conveniently have one inside our local Walmart. Whenever I run in to pick something up, the smell of freshly baked pretzels just hits me in the face. Now I don’t know if you’ve ever been hit in the face with the smell of pretzels, but it’s pretty difficult to ignore. I’m pretty sure they vent their ovens right into the entryway of the store, too. And then they have a big sign advertising “Free Samples.” Are you kidding me? It’s hard enough to avoid the delicious smells! Seeing as how I usually do my shopping at like 9am on a Monday, I’ve been pretty good about avoiding the mid-morning pretzel snack. But they’ve been advertising these Pepperoni Soft Pretzels for a while now…woah. Talk about an amazing idea! How exactly am I supposed to ignore that kind of deliciousness? Well, in true Laura fashion, I haven’t succumbed to the pretzel store inside of Walmart. But I have given in and made batches of Pepperoni Soft Pretzels here at home. (Note that batches is plural. As in very plural. As in batcheseses.) 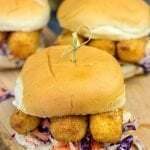 But there have been a lot of football games on lately…and playoff football requires epic football food. 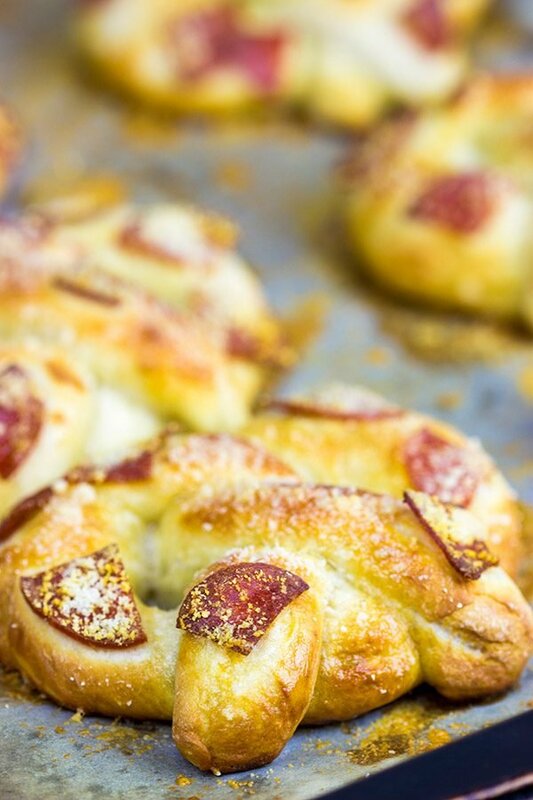 So I have dutifully obliged by making batches of these Pepperoni Soft Pretzels for us. 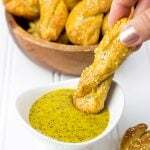 We’ve been hanging out with our friends and neighbors a lot watching football, and these pretzels have been a big hit. We’ve become the “go-to” house for watching playoff games…and I haven’t even vented our oven into the doorway. Yet. Using a countertop mixer, combine all of the dough ingredients (flour, salt, brown sugar, yeast, and warm water). Mix on medium speed for 6 minutes. 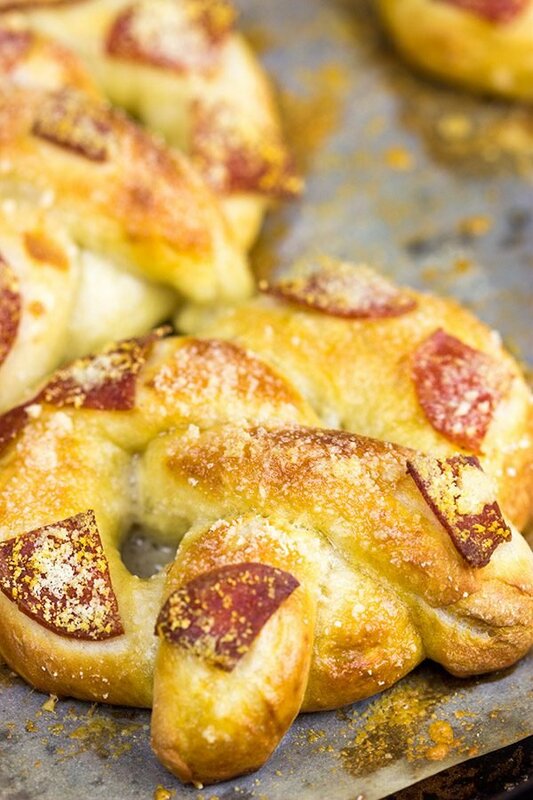 Sprinkle tops of pretzels with Parmesan cheese and then lay sliced pepperoni on top. Let pretzels rest for 10 minutes uncovered. Meanwhile, preheat oven to 475°F. 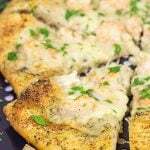 Serve with favorite marinara sauce for dipping. Awesome David.. Such a clear demo on shaping the pretzels. Im going to try this weekend!! Soft pretzels are really fun to make, Bindia! Do give them a shot sometime. 🙂 Thanks so much for stopping by and commenting! Man, I was hoping you could help me find the answer, Dawn! Soft pretzels are SO darn addicting. They’re fun to make at home, and they taste so good. 🙂 The pepperoni on top is totally not necessary…but man does it add a fun twist (no pun intended…haha)! Hope you finally got over your pretzel addiction yesterday. And you hope you have a great weekend yourself! Yes, don’t go anywhere near a mall in the next month if you are craving pretzel goodness, Mary! Pretzels are indeed fun to make at home…but dangerous since they are also quite fun to eat at home. Like every single one. Haha! 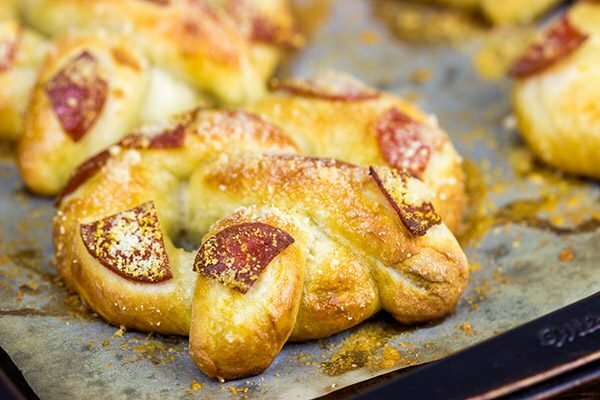 Hang in there, and remember these Pepperoni Pretzels for when you are allowed to cheat a little bit! Have a great weekend, my friend! Im seeing so many ‘game day’ recipes over the net recently. 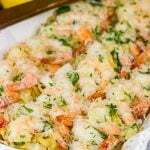 Boy do I wished the UK celebrated game day like you guys do….your recipes always make me drool and this one isnt an exception! Oh man, the Super Bowl is the best, Lucie! And it always comes at the best (or worst…) time since it’s about when you’re over the New Year’s diets. 🙂 Thank you so much for your kind words. I hope you have an awesome weekend! I see your point, David. And you know what? You should switch to loving something different. Something you won’t easily stumble across at Walmart. I’m thinking of…mmmm….lavender! Trust me, it’s hard to accidentally find a store or lavender field in a city:) So you should consider such an option. 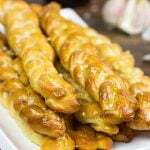 And don’t forget if you need help with destroying some these delicious pretzels, I’ll gladly give you a hand. Wait…they don’t sell lavender in Walmart!? Then what the heck is that stuff I’ve been buying every week?? 🙂 I did a fair enough job destroying these pretzels on my own (with some help from the folks at the curling club), but I will definitely give you a call next time I make a batch. Like tomorrow. And the next day. And the next day after that. Have a great weekend, Ben! Homemade pretzels are my FAVORITE. They go perfect with football watching as you mentioned…so, I pretty much need to make soft pretzels for the Super Bowl I think! Yes! 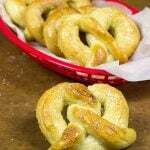 You definitely need to make soft pretzels for the Super Bowl. I love making homemade bread, and pretzels are just a twist (no pun intended!) on bread. The pepperonis here aren’t required, but man are they delicious. 🙂 I hope you guys have an awesome weekend out there in Cali, Nicole! Wait – your walmart has a pretzel store??? That’s it! Now I don’t have any excuse not to move when (and if) Lil Shashi moves that way! I ADORE pretzels and don’t ever ignore them when my nostrils are arrested by their fumes! But, there’s no doubt these pretzels are way, way better than those ones at the mall that I succumb to! Yeah, it’s a little strange…but our Walmart totally has a pretzel store inside. Right as you go in. And it always smells SO good. If/When you guys move here, we can meet at the pretzel store on Monday mornings! 🙂 These homemade ones turned out really, really, really good though. Happy Monday, Shashi! Holy smokes I could eat two of these and I haven’t had my morning shake yet! I’ve never made these before and I think it would be fun. 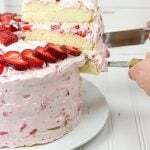 Great tip: “Spray the parchment paper with non-stick spray first. This will help keep the pretzels from sticking to the paper.” I have run into that before with other dough recipes… why hadn’t I thought of that? Hey, who said you couldn’t have pretzels for breakfast?? 🙂 Yeah, that silly pretzel dough can just adhere to parchment paper. As in, the paper becomes part of the pretzel…and no force is gonna separate the two! Have fun making (and eating) pretzels, my friend! Sucker for advertising and MALL PRETZELS?! Geebuz, Auntie Anne’s should be my aunty. Seriously. Although post 2009, I never saw their sample pieces. 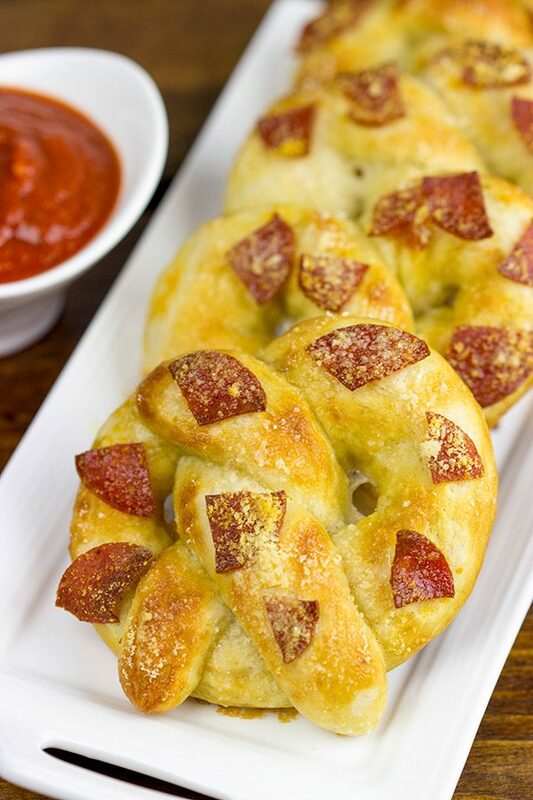 Love this pepperoni addition- Pretzels are one of the few things where sweet OR savory offerings are winners.